The Scoop: Some matchmakers encourage their clients to have low expectations, reasonable standards, and realistic aspirations, but Lydia Davis does not hold to that line of thinking. This UK matchmaker empowers singles to maintain high standards for their dream dates and never settle for second best. In 2018, Lydia launched a dating app called Toffee to connect UK singles who have attended private schooling. 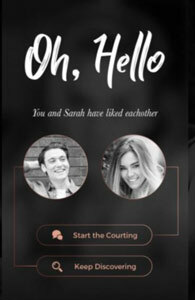 This posh network promises to increase the odds of meeting a worthwhile date prospect with every swipe. Instead of forcing singles to waste time sifting through mediocre dates, Toffee.dating raises the bar and invites single men and women to pursue the kind of relationships they desire and deserve. Lydia Davis has always considered herself a hopeless romantic. She grew up playing Cupid for her friends and dreaming of love herself. Becoming a professional matchmaker seemed a natural fit for her talents and interests. 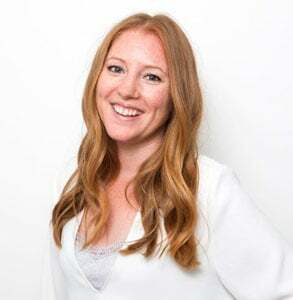 Matchmaker Lydia Davis launched a dating app in 2018 to empower UK singles to date more effectively. In 2012, Lydia founded a dinner dating company called Table8. The company ran dinner parties for, you guessed it, eight singles who wanted to sample good conversation and delectable meals in some of the finest restaurants in London. This was her first foray into the dating industry, and it went off without a hitch. Many couples happily clinked glasses at these exclusive matchmaking events. Table8 was recognized with the UK Dating Award for the Best Food or Drink Dating Event in 2014. That same year, it was runner-up for the Best London Dating Event. Lydia’s success encouraged her to branch out and use her networking skills to bring more UK couples together. “After a few years, I sold the business and moved into matchmaking and haven’t looked back since,” she said. Over the last year few years, Lydia has worked closely with singles who want to find love but often struggle in a fast-paced and crowded dating environment. Fortunately, this forward-thinking matchmaker is always brainstorming and developing ways to improve the dating scene. Once dating apps started becoming more popular, she decided to get in on the action and use this technology to make it easier to find a quality match. Lydia came up with the idea for a dating app for private school alums, and the rest, as they say, is history. Toffee launched to much fanfare in the media in April 2018, and it has built a massive following as hundreds of highly selective singles enroll in the app to meet people who share similar backgrounds and sensibilities. Since she was young, Lydia has had a knack for understanding what singles want and pairing up compatible couples. In her early 20s, she organized dream-date auctions to raise money for charities. She encouraged singles to bid on eligible bachelors or bachelorettes, and those fun dates actually led to a few relationships and even a couple weddings. Toffee focuses on a niche market of singles who attended private schools. Now she has created yet another fun yet effective way for singles to meet and fall in love. Toffee is Lydia’s passion project. After working as a matchmaker for years, she realized online dating wasn’t satisfying high-brow daters. She heard many well-educated singles say they wanted to date with more precision. This concern resonated with Lydia, who went to private school, and she launched a high-caliber dating network to support private school graduates in the UK. Lydia said will continue working as a matchmaker for another few months, and then she’ll start concentrating on Toffee full time. While she has loved introducing London singles on dates, she sees more potential to help inspire loving relationships as the owner of a niche dating app. Toffee’s far-reaching yet targeted network can facilitate more dates and relationships than she ever could on her own. It has taken her nearly a year to develop her idea into a fully functional dating app, but she has fulfilled her goal of starting a business that makes a meaningful difference in people’s lives. Toffee began in the UK, but the team expects to attract an international membership in the coming years. As the dating app expands, it’s bound to turn a few heads with its unique premise — and that’s part of the fun. The private-school-only dating app has some detractors, but it also has many fans and followers who say they’ve been waiting for a dating platform to cater to their needs. Toffee helps members select dates based on their personal preferences. The Toffee team is continually improving and perfecting the niche dating app. They study trends in the dating landscape, observe how members engage on the app, and incorporate user feedback when updating the app. Some of the app’s newest features include a social calendar that shows users if a match is attending the same event they are — which makes it easier to set up a date in an organic way. Lydia said they’ve also added prompter questions to facilitate conversation on the app and a matching graph to show users how compatible they are with one another. Toffee’s targeted and socially attuned matching system can help members choose partners who complement them, and build a solid foundation for a relationship. 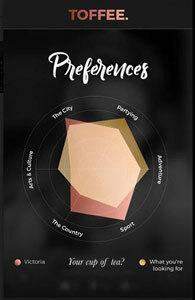 Every dating app has a brand or reputation that makes it stand out and target a specific audience. Bumble is the feminist app; Hinge is the relationship app. HER is the women-only app, and Toffee is the posh dating app. The selling point of these services is that singles can choose which message, audience, and style resonates with them, and, in so doing, they’ll join a network of people who share similar preferences, outlooks, and lifestyles. Lydia is a self-starter with big ideas and bold plans for the future. Thanks to her entrepreneurial spirit and creativity, singles now have a new way to connect with fellow private school graduates across the country. Toffee has made an impression on the dating industry by dismissing the idea that dating sites or apps must include everyone everywhere. Its groundbreaking premise, targeted audience, and top-notch design has appealed to singles who maintain high standards in the dating scene. Toffee gives its members the chance to narrow the dating pool to high-caliber, desirable individuals in their area. Since its launch, the app’s elite network has grown by leaps and bounds in the UK, and the team plans to expand its reach across the globe in the next year or so. Ultimately, Toffee won’t stop until it has claimed a prestigious place in the hearts and minds of daters around the world.